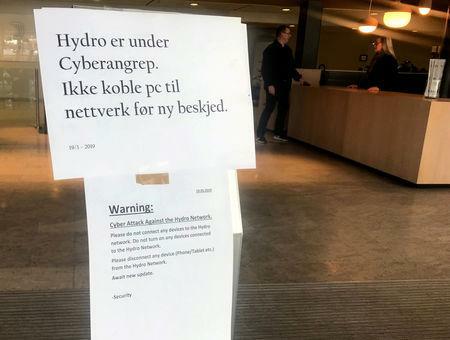 OSLO (Reuters) - Norsk Hydro, one of the world's largest aluminum producers, said a key unit is operating at only 50 percent of capacity following a cyber attack on the company this week. "Extruded Solutions is working hard to enable further restarts during the coming days, which would allow for continued deliveries to customers," Hydro said of the business, which transforms aluminum ingots into components for carmakers, builders and others. The plants were shut following the attack that began on Monday, while the company's giant smelters in Norway continue to run on a partly manual basis to avoid becoming affected, Hydro said. Hydro's Rolled Products unit, which makes metal sheets for packaging and other industries, was running "mostly as normal, with only a few exceptions", the company said. "The root cause of the problems has been detected, a cure has been identified, and together with external partners, including national security authorities, Hydro’s experts are working on reverting virus-infected systems back to a pre-infected state," it added. Hydro lacks a complete overview of the timeline toward normal operations, however, and said it was still unable to estimate the operational and financial impact.